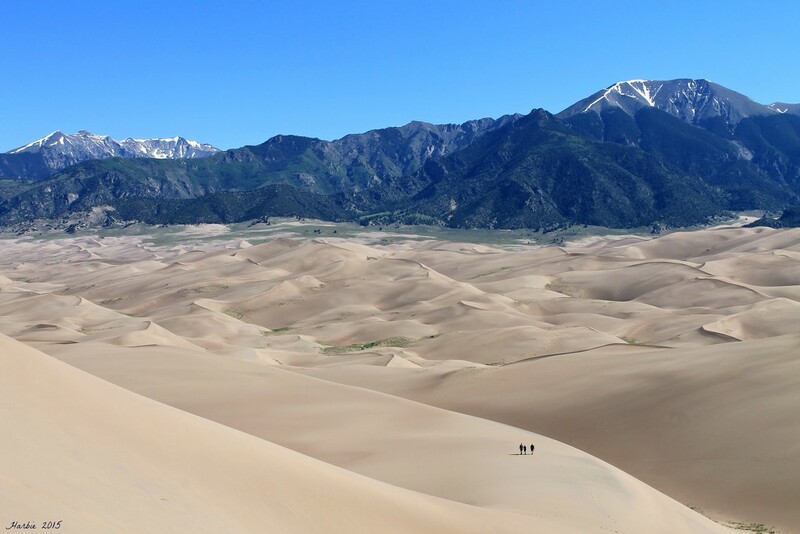 We were hiking to the top of one of the many larger sand dunes in Great Sand Dunes NP. You really never realize how large the Dunes are (even when you are on them) until you see other people on them too. This shot shows my husband, nephew, and brother in law in the distance. They decided to take a steeper way down (they ran). It was neat to see them down low already while we were still fairly high. I love how the mountains are behind the dunes. Hiking in the sand is certainly a great leg workout! Best on black. Thanks so much for your views, comments, and faves for "Kite's Up!" I appreciate it! :)! Amazing! We simply must go there. Is the sand hot? At White Sands, because the grains are gypsum, they reflect rather than absorb the heat. Strange to see them up against those huge mountains! @cejaanderson the sand does get hot, Jane, so if you want to hike on the dunes you need to start in the early morning. We started around 8:00. Some people even hike at night iif there is a bright moon. :)! wow ~ amazing! all that sand in a land-locked state like Colorado! "The park contains the tallest sand dunes in North America, rising about 750 feet from the floor of the San Luis Valley, covering about 19,000 acres. Researchers say that the dunes started forming less than 440,000 years ago ~ from sand and soil deposits of the Rio Grande and its tributaries, flowing through the valley. Westerly winds picked up sand particles from the lake and river flood plain (and deposited them here). This process continues, and the dunes are slowly growing. The wind changes the shape of the dunes daily." Great shot. It took me a minute to even find the people! @sitiodown Thank you for adding all that wonderful information! I always post so late at night and run out of time that I don't usually post interesting information about the area and the dunes definitely are unique and interesting!! :)!